There is a Santa Claus! I cannot pass on this picture without leaving a comment. Judging from the white brim on his cap, I’d say the gentleman in the center-right is the fire chief – a perfect example of group effort from the top down and community service from the bottom up. How can so few do so much with so little? TEAMWORK! Is it any wonder so many of us grew up wanting to become firefighters and police officers? To the members of Monroe High School, class of 1963, THANK YOU! for this great picture and these wonderful comments. I'll try again! In the Fire Dept pic where the guys are working on refurbishing "toys 4 tots", the man on the right with with his back to the camera is Chief Goodwin. I think the guy in the center with his head down is Ralph Skinner and I am certain the man on the far left is Melt Trull. Geez, Ruth Anne & I felt so priveledged to be kids of the fire chief!! Also, we were priveledged to live directly across the street & be able to run over to the fire station at will and SEE the firemen refurbishing all those donated toys! Occasionally, they would have extra wheels which they would give us. We would then go next door to to Mr. Copple's furniture store. They'd receive large furniture & appliances shipped "crated" up in wood boards and he'd store them in the shed out back at the end of the driveway we "shared". [in the pic "Monroe Fire Queen" you can see the back of Copple's & the storage shed and part of our yard! ]Poor Mr. Copple - he truely had the patience of Job!! Ruth Anne & I would literally beg him for boards, then "borrow" his hammer and some nails - and scuttle back into our yard to build our own motorless "go-carts".....which we'd race back & forth on the sidewalk in front of the furniture store!! Mr. Copple was such a love!! Did I mention the elevator in his store we rode up & down at least a ZILLION times!! Just think, he had to put up with Clark, Don and Sam before Ruth & I came along!! 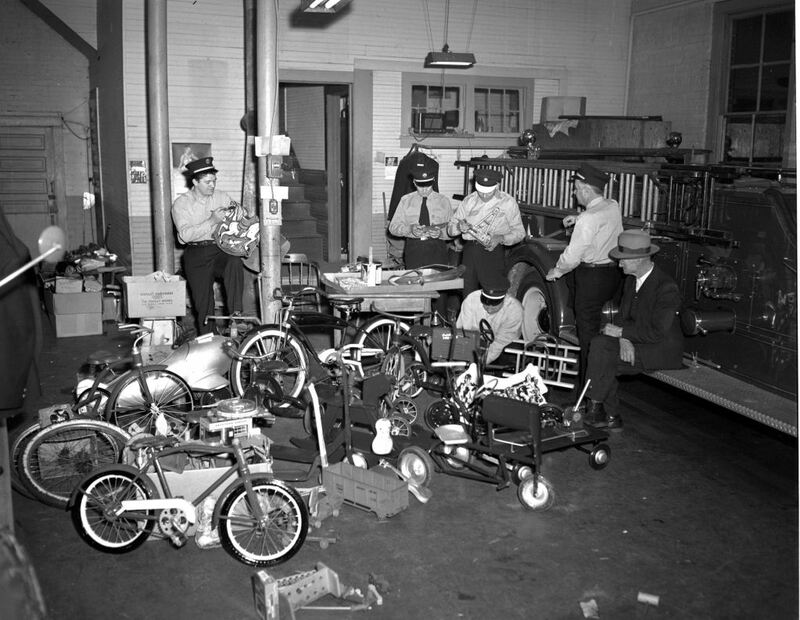 After Dad became ill, Mr. Jessie Helms (father to Senator Jessie) "looked after us" and made sure we got some of those great toys for Christmas too! EVERY business owner in the old town of Monroe was really GREAT to the Goodwin family during those early years of our Dad's illness!! Loved the pics of the STATE & CENTER movies!! ANYONE remember the "PastTime Theater" on Hayne St. between old Davis Williams Dept store, the "Feed & Seed Store" [where Sue Rogers Goodwin's granddad, Mr. Polk worked??] and Mr Clyde's OASIS Sandwich Shop?? where I worked at age 14! I remember the side door for serving "coloreds" .....oh dear, I must stop! I'll get into the Civil Right MARCHES on Hayne Street & the mosquitoe fogger trucks!! a SAD TIME in our history! 'Nuther time!! Mystery Blogger, send some more pics our way! They are great! Caroline.........I was SO glad to see your Comment today! Have been waiting, hoping you'd share more about this picture with us. I know Jim & I have already had "Personal Picture" surprises on this BLOG, and so many others finding special memories about pictures, but I could only imagine how exciting it must have been for you to suddenly see this of your Dad pop up. How wonderful. Loved the story about you and your sister Ruth Ann buidling the "go-carts".....sounds exactly like the Little Rascals cartoons! I do remember the set-up at Oasis, but had forgotten you worked there. (At least we know customers at both doors got a smile!). A big treat for my brothers and me when we were little, was a Sunday afternoon "ride into town", and ice cream cones from Oasis with our parents. So happy to have classmate "family" to enjoy these old memories with, since parents are no longer here. Mine would have both loved reading all our notes. Thanks again, Mystery Blogger. The MHS BLOG is doing so much for all of us!